Working in Access 2007 is easier once you understand running the Access 2007 window and using tools to help manage your data and answer your questions. 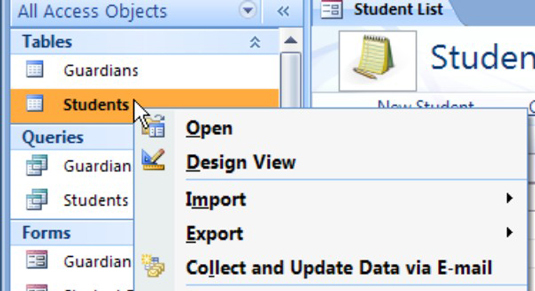 After you open Access 2007, and pass the Getting Started window, you’ll find these buttons, bars, and ribbons in the Access 2007 regular window to help organize, create and protect your data. Quick Access Toolbar: Each one has its own ribbon of commands and things you can do. The toolbar changes depending on what you’re doing at the moment. Ribbon: Stuff you can do right now. 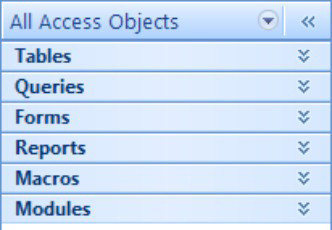 Each Quick Access Toolbar item has its own ribbon. Point to any icon for info and instructions. Shutter Bar: Also called the Object list. Organizes stuff in your database. Security Bar: Protects you from unknown macros and code. Click Enable Content if you trust the source. Click Trust Center to make it back off. Screen Tips: Point to any item (touch it with the tip of the mouse pointer) to see its name and description. Right-click any object’s name to see stuff you can do with it. Click any triangle arrow like the one in the circle to see a drop-down menu. Click any double arrow, like « and » to show and hide things. Help: Click any question mark for help.